The garden is increasingly seen as an extension of the house. As soon as the weather allows it people live outside as much as possible. But the English weather can still sometimes throw a spanner in the works. A colourful mexican fireplace or clay chiminea can provide a pleasant and warm terrace. This allows you to enjoy your garden and terrace more and for much longer. The outdoor season will be considerably longer with a outdoor fireplace. Mexican fireplaces are real eye-catchers in your garden and give a cozy Mediterranean atmosphere to the whole. These colorful terrace fireplaces are beautifully designed so it's always a pleasure to watch. 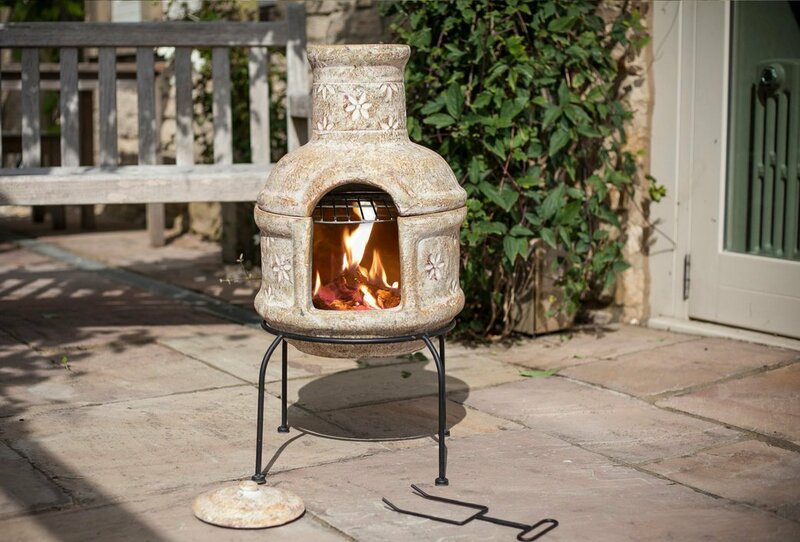 Due to the beautiful size of these fireplaces, they are suitable for any garden. The Mexican fireplace is made of ceramic stone / clay and is often made by hand. This makes the fireplace of high quality. A Mexican fireplace is perfect for making a cozy fire where you can have a nice drink with family and friends around. • Allow the stove to cure well before use. By warming the stove and then cooling it down will the product cure. Repeat this procedure at least twice. Look for the exact procedure in the supplied manual. • Apply a minimum layer of 5 cm (build) sand or lava rock to the bottom before use. This helps the fireplace to protect from excessive heat and cracking. Fuel may not be burned directly to the bottom of the hearth. • The fires are treated with an impregnating agent. It is recommended that you regularly re-treat your Mexican fireplace to extend the life span. Use ceramics impregnation agent. • Never use gasoline, turpentine, benzine, alcohol or similar chemicals to ignite the fire. A too high temperature rise can cause the fireplace to rupture. • To extinguish the fire in the hearth, stop adding fuel and burn the fire. You can also stop the fire with sand but never use water. Caution: Always read the supplied manual before using the stove.